I have fasted on Yom Kippur as long as I can remember and am nostalgic about the bagels and smoked fish break fasts with my late parents and aunts and uncles. Truth be told, I’ve never been uplifted by the fast. I’ve never felt inspired by causing self-inflicted pain and starving myself. I fail to see what it accomplishes or how it makes me a better person. I still have my health, thank God, and plan to fast this year, but would appreciate some inspiration to make it more meaningful. I’m glad you still have your health! May you continue to enjoy good health this year and many more to come! If the fast was indeed to cause pain and starve ourselves, I wouldn’t be very inspired to do so either. Furthermore, if the point is to feel pain, why do Jews traditionally wish others to “have an easy fast?” It should rather be “have a miserable fast”! I think we need to reframe the entire concept of the fast on Yom Kippur, which will enable us to view it in a different light. The source for fasting is in the Torah, which states “But on the 10th day of this (the seventh) month is the Day of Atonement… and you should afflict your souls…” (Vayikra/Leviticus 23:27). “Afflicting” is interpreted by our sages in the Talmud to mean we should fast, hence the mitzvah to fast on Yom Kippur. This, however, needs explanation. The Torah does not say to afflict our bodies, rather our nefashos or souls, through the fasting. This seems strange, as a fast would seem to afflict the body, not the soul. How can we understand this? The mitzvah to “rest” from food and drink also includes desisting from bathing, from wearing leather shoes and from marital relations. All this elevates us to a higher, spiritual world where we can view the world and ourselves from a different vantage point. My mentor, the late Rabbi S. Wolbe ob”m, once gave us a powerful illustration by which to understand the day of Yom Kippur and its laws. Maimonides, in discussing the final world of reward, says the following: “The World to Come has no eating nor drinking, rather the righteous sitting with their crowns upon their heads, and basking in the glow of the Shechinah (Divine Presence).” This is the feeling one has on Yom Kippur. This holy day is a bit of the next world transposed to this world. On Yom Kippur, by refraining from the mundane pursuits of this world, we are transformed into an angelic state whereby we don’t need to eat, much like the angels above are above eating and derive their sustenance from the glow of the Shechinah. With the closeness we enjoy we can intensely feel any distance from the Shechinah we have caused, and fulfill the mitzvah of teshuvah, or return to God and our true selves. May you and all the readers have an easy, meaningful fast and be inscribed in the Book of Life for a sweet, happy New Year. Dr. Susie Wolbe, the author of The Empowered Teacher, is a Mindful Schools instructor and certified academic language therapist. powered teacher with great history in the community is sharing her not-so-secret tips through her recently published book, The Empowered Teacher: Proven Tips for Classroom Success. Dr. Susie Wolbe, a 22-year veteran of public and private schools, retired from her principal post, but is not ever likely to stop educating others. In a span of four years, Wolbe lost both of her parents and had two children get married. The circle of life was spinning. “Lifecycle moments can bring you to your knees and have you wondering what you are going to do next,” she said. The notes she had kept were “calling to her,” and with the support of her friends and family members pushed her to publish The Empowered Teacher. “It’s not a psychology or theory book, but a ‘to-do’ for the classroom,” Wolbe said. The book addresses relationships and communication, management and planning, classroom involvement and beyond, support and partnerships, professional successes, personal growth and well-being. Wolbe taught many grade levels before serving as a principal for kindergarten through eighth grade for 14 years at Levine Academy. She also taught at Carrollton Elementary School and the Hockaday School. Wolbe, who provides single- and multiple-session programs, works one-on-one, in groups large and small, and leads seminars in person, via teleconferencing, Facetime and Skype. She provides the ingredients and the recipes for success, but guides her clients to find their own way. “I don’t want them to rely on me — but to learn from me,” she said. For Patti Brooks, recently retired after 33 years at Lakehill Preparatory School, as teacher and head of the Lower School, bringing Wolbe in for a six-week series on mindfulness was a great success. Wolbe’s program at Lakehill, working with students, faculty and parents, focused on bullying and conflict resolution. Those tools helped Shannon Santos’ 11-year-old daughter succeed in school. “The calming tools she provided will last us way beyond the classroom as parents are able to support their children at home,” said Santos, whose daughter Harper plays tennis 15 hours a week. Santos, Harper’s father and stepmother met with Wolbe. Pointing to direction with methods of breathing and meditation to assist with sleep, calmness, focus and more, Santos said that Wolbe’s advice has helped the whole family to keep calmer during the everyday frustrations with life. Wolbe keeps a bag of the bracelets available on her website and in her car, and gives them out regularly. Wolbe, formerly the “Roses” behind the children’s clothing manufacturing team of “Roses and Pearls,” is also a licensed real estate broker. She and her husband Ellis belong to Congregation Anshai Torah. They have five children and seven grandchildren — five between the ages of 2 and 4. She enjoys reading, learning “anything,” volunteering through the National Council of Jewish Women, attending conferences and spending time with her family. For more information or to contact Dr. Wolbe, visit drsusiewolbe.com or call 972-345-0744. I have fasted on Yom Kippur as long as I can remember and am nostalgic about the bagels and smoked fish break fasts with my late parents and aunts and uncles. Truth be told, I’ve never been uplifted by the fast. I’ve never felt inspired by causing self-inflicted pain and starving myself. I fail to see what it accomplishes or how it makes me a better person. I still have my health, thank God, and plan to fast this year, but would appreciate some inspiration to make it more meaningful. I’m glad you still have your health, may you continue to enjoy good health this year and many more to come! I think we need to reframe the entire concept of the fast on Yom Kippur, which will enable us to view it in a different light. The source for fasting is in the Torah, which states “But on the 10th day of this (the seventh) month is the Day of Atonement… and you should afflict your souls…” (Vayikra/Lev. 23:27). “Afflicting” is interpreted by our sages in the Talmud to mean we should fast, hence the mitzvah to fast on Yom Kippur. This, however, needs explanation. The Torah does not say to afflict our bodies, rather our “nefashos” or souls, through the fasting. This seems strange, as a fast would seem to afflict the body, not the soul. How can we understand this? The answer is that the affliction is not the fasting itself. The fasting, which enables us to rest for a while from our physical pursuits, merely provides the backdrop to enable us to focus on our souls, which is the real point of the day. When we focus on our souls and how far we may have strayed from the right path, then the soul is afflicted with that realization. Maimonides points out that the mitzvah on Yom Kippur is not “to fast,” as with other fast days, rather to “refrain from eating.” When we are on a higher, more spiritual plane, we have the opportunity, indeed the mitzvah, of getting in sync with our souls and seeing how we can better ourselves. The mizvah to “rest” from food and drink also includes desisting from bathing, wearing leather shoes and marital relations. All this elevates us to a higher, spiritual world where we can view the world and ourselves from a different vantage point. My mentor, the late Rabbi S. Wolbe ob”m, once gave us a powerful illustration by which to understand the day of Yom Kippur and its laws. Maimonides, in discussing the final world of reward, says the following: “The World to Come has no eating nor drinking, rather the righteous sitting with their crowns upon their heads, and basking in the glow of the Shechinah (Divine Presence).” This is the feeling one has on Yom Kippur. This holy day encompasses a bit of the next world transposed to this world. On Yom Kippur, by refraining from the mundane pursuits of this world; we are elevated to an angelic state whereby we don’t need to eat. This is much like the angels have no need because they derive their sustenance from the glow of the Shechinah. With the closeness we enjoy we can intensely feel any distance from the Shechinah we have caused, and fulfill the mitzvah of teshuvah, or return, to God and our true selves. The Texas Region of the Bnai Zion Foundation has a tradition of hosting a lunch for the annual gala honorees. This year’s gala is Nov. 13, 2016, at the Westin Galleria in Dallas. 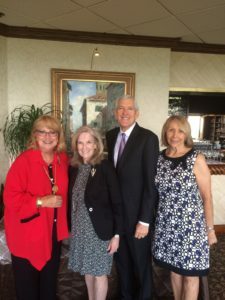 Earlier this month, Diane Benjamin (left), president of the Texas Region of Bnai Zion, met at the Park Cities Club in Dallas with gala honorees, former Dallas Mayor Tom and Laura Leppert (center right and center left, respectively). The couple will receive the Bnai Zion Distinguished Community Service Award at the gala. Bnai Zion Foundation Texas Region Executive Director Avrille Harris (right) joined the honorees and Benjamin to thank them for their contribution to our community. As part of Congregation Beth Torah’s inclusion initiative, the synagogue is hosting a series of free monthly lectures on common psychiatric disorders. The first seminar is Sunday, Sept. 25, at 10 a.m. at Beth Torah, and will focus on depression. Dr. Alan Koenigsberg, a clinical professor of psychiatry at the UT Southwestern Medical School who also has a private practice, will conduct the sessions, and the public is welcome. Subsequent lectures will deal with anxiety, ADHD and other topics. Last year Beth Torah became one of 16 Conservative synagogues across North America selected for a new effort to make Jewish communities more welcoming to people with special needs. The project is a partnership between the United Synagogue of Conservative Judaism and the Ruderman Family Foundation. Beth Torah is located at 720 W. Lookout Drive in Richardson, near the crossroads of Bush Turnpike and Central Expressway. For more information, call the synagogue at 972-234-1542. 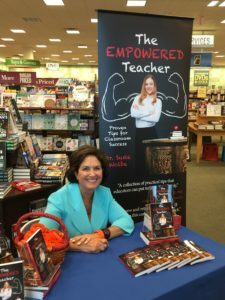 Noted educator and NCJW-Greater Dallas Section Co-Vice President of Community Service Susie Wolbe, Ed.D., has just published a book, The Empowered Teacher: Proven Tips for Classroom Success. A special event in connection with this publication will take place at Barnes & Noble at Preston/Royal Sunday, Sept. 25-Tuesday, Sept. 27. Show a voucher at checkout or simply tell the cashiers that you are participating in the “NCJW Book Signing Event” and a percentage of your purchases will go toward NCJW (National Council of Jewish Women). Vouchers are obtainable through NCJW’s website (ncjwdallas.org), Facebook, at the NCJW office and through the NCJW weekly E-Blast. Just present the voucher at checkout or inform the cashiers you are participating in NCJW’s Book Fair. Purchase of all items in the store are eligible for purchase within the Book Fair guidelines, including some Starbucks products. Based on years of experience as a teacher and principal, Susie Wolbe outlines helpful hints to create an ideal learning environment in the home as well as in the classroom. It is a must-read for teachers and parents of young children. Members of the community are encouraged to purchase the book for teachers, libraries, synagogue and day school libraries and public and private schools. From 1 to 3 p.m. Sunday, Sept. 25, stop by the special table in the front of the store to talk to the author, Dr. Susie Wolbe, about her book and to purchase an autographed copy. Abigail Kerner, daughter of Debra and Stephen Kerner, and Adat Chaverim member, is part of a cohort of 31 teens from across North America on the NFTY-EIE (Eisendrath International Experience) High School in Israel program from August through December. The NFTY High School in Israel–Eisendrath International Experience (EIE) is a semester-long (four months) program for high school students in grades 10-12 in Israel. Named for the late Rabbi Maurice N. Eisendrath, past president of the Union of American Hebrew Congregations, now the Union for Reform Judaism, EIE is an intensive academic program and is fully accredited by the Middle States Association of Colleges and Schools. The program was established in 1961 by NFTY, the youth arm of the Reform Movement. Many of the leaders of Reform Judaism today are alumni of this program. NFTY-EIE is based on Kibbutz Tzuba, located in the Judaean Hills approximately 15 minutes outside of Jerusalem. With very small class sizes, students take an advanced Jewish history class, an advanced Hebrew Ulpan, and their regular general studies courses to fulfill the requirements of their home high schools. NFTY-EIE students have a unique opportunity to benefit from experiential learning. Tiyulim (field trips) are taken to visit whatever they are learning about in their Jewish history class. Approximately three days a week are spent outside the classroom on field trips. There are also numerous weeklong trips throughout the semester, including a trip to Poland to study the Holocaust, a week in Gadna (a simulated Israeli army training experience), and a hike across the country from sea to sea. Registration is open for EIE’s Spring 2017 and Fall 2017 sessions. More information can be found at www.nftyeie.org. Yavneh junior Griffin Levine will travel to Israel as a member of the 18-and-under boys’ basketball team for the USA competing in the 20th International Maccabi Games next summer. This is a tremendous honor for Yavneh and the Dallas Jewish community. Levine, the starting point guard on Yavneh’s varsity basketball team, traveled to Los Angeles this summer for tryouts. “Griffin is an incredibly talented, versatile player who is the consummate team-first basketball player,” said David Zimmerman, athletic director and boys’ basketball coach. The full roster was not released by press deadline. 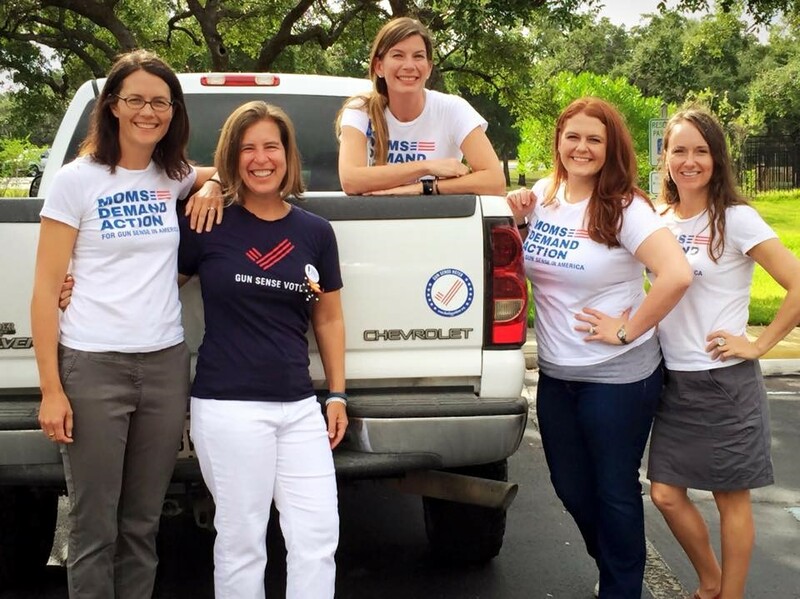 Submitted photo Anna Kehde (left) leads the Texas chapter of Moms Demand Action. She will speak at the NCJW meeting. The National Council of Jewish Women, Greater Dallas Section, will feature a program on “Bringing Gun Sense to Texas” at its Annual Spring Meeting at 10 a.m. Thursday, April 7 at Bent Tree Country Club. Anna Kehde, leader of the Texas chapter of Moms Demand Action, will be the featured speaker. As an organization that cares deeply about the safety of its children and grandchildren, NCJW is committed to bringing information to members, supporters and the broader community to help protect our families and friends. At an upcoming meeting, NCJW Dallas President Caren Edelstein, and Rhona Streit, nominating committee chair, will present the 2016-2017 proposed slate of officers, directors for approval by the membership. The proposed 2016-2017 slate of officers is: president, Joyce Rosenfield; vice president administration, Renee Karp; vice president community service, Nonie Schwartz and Susie Wolbe; vice president financial development, Stacy Barnett; vice president membership, Amy Schachter; vice president public affairs, Elaine Bernstein and Jayme Cohen; vice president communications, Marlene Gorin; recording secretary, Jackie Fleschman; associate secretary, Jo Reingold; treasurer, Ellen Lasser; and associate treasurer, Teresa Rosenfield. Directors to be approved include: Carol Alkek, Andrea Wolf Bleicher, Liz Cooper, Laura Diamond, Kristen Fagelman, Marilyn Fiedelman, Debra Levy-Fritts, Risa Gross, Jane Lachman, Barbara Rose, Randi Smerud, Debby Stein, Carol Tobias, Melissa Tone, Carol Weinstein, and Debby Weinstein. Proposed Nominating Committee members to be elected are: Robin Zweig, chair; Carole Cohen, Frieda Hudspeth, Peggy Millheiser and Rosie Stromberg, members. Cost is $18 per person. The meeting will be held at the home of a NCJW member. For more information and to make your reservation, visit ncjwdallas.org or call Nicole Gray 214-368-4405 ext. 102. Mazal tov to Paul Kinberg, DPM, who was honored with the Award of Excellence on Sunday, March 20 by the American Podiatric Medical Association. Dr. Kinberg was nominated by Leslie Campbell, DPM, then president of the Texas Podiatric Medical Association. The award is presented to members in good standing in recognition of outstanding national accomplishments in scientific, professional, or civic endeavors. Nominees must have demonstrated outstanding service to APMA. Dr. Kinberg graduated in 1974 from the Ohio College of Podiatric Medicine (now Kent State University College of Podiatric Medicine). He completed a preceptorship with Bernard J. Hersh, DPM, in Dallas in 1978. Among his awards are the Texas Podiatric Medical Association (TPMA) Distinguished Service Award in 2004, and a spot on Podiatry Management magazine’s 175 Most Influential Podiatrists list in 2006. He has published countless papers and given lectures to contribute to and influence the profession. Dr. Kinberg’s work on the ICD-10 conversion has (helped) many APMA members make sense of the change in how we bill our services. He has shown his leadership abilities as he has taken the reins on this project for APMA. Dr. Kinberg spearheaded APMA’s plan for podiatric physicians in preparation for the ICD-10 initiative. This required an enormous effort with countless hours of dedication. There’s no one I can think of in this profession (who) has earned APMA’s Award of Excellence more fully than Dr. Kinberg. Dr. Kinberg thanked his family and colleagues and those who recommended him for their encouragement. He thanked Don Canada for more than 25 years of work for the profession and for being a friend and mentor. He also thanked APMA Health Policy and Practice Director Scott Haag, JD, MSPH, for his unwavering leadership and skill and lauded the work of APMA Consultant Harry Goldsmith, DPM, and his dedicated service to podiatric medicine. “Holocaust Survivor and Hidden Child Simon Gronowski,” which was planned for 6:30 p.m. Thursday, April 7 at Booker T. Washington, has been canceled. It is with mixed emotions I am just arriving back in Dallas from Israel from my son Elazar and Aliza’s wedding, a heavy heart to leave our beloved homeland, but still filled with joy from all that transpired there this past week for my son and new daughter-in-law and our respective families. This is with the backdrop of the upcoming fast of the 17th of Tamuz just around the corner, Sunday, July 5, which begins the annual three-week mourning period over the destruction of the Temple and subsequent exile from our homeland which lasts until today. In that context I will share with you part of a d’var Torah which I delivered at the final Sheva Berachos celebration in Jerusalem right before leaving for the airport. In last week’s Torah portion we read the famous story of Moshe striking the rock to get it to emit water for the Jews in the desert, rather than speaking to the rock as God had commanded him. By labeling them as “the rebellious ones,” Moses had created a subtle separation between himself and the Jewish people. Miracles are performed by God only in the merit of the Jewish people, not for an individual. Hence, the waters did not flow for him immediately. My mentor, Rabbi S. Wolbe, ob’m, used this teaching of ibn Ezra to explain why, hence, Moses could not bring the Jews into Israel. Israel is the place of “Who is like you, Israel, one nation in the land.” The uniqueness of the Jewish people is its “oneness”; like there is one God there is one Jewish people; the sum total of all the Jews is one whole. The place for that unity and completeness is in Israel. Moshe, who lived his entire life for the sake of the Jewish people, uttered a statement which put a blemish on his unity with the Jewish people and could not be the one to usher them into the Land of Israel. It was disunity, sinas chinam, or idle hatred and gossip against one another, which caused the destruction and exile from Israel. Israel is acquired threw unity and lost over discord. This is a very sobering fact, given the extreme disunity we sadly find in Israel today. The converse of this, in a positive light, is the statement of the Talmud, “anyone who brings joy to a chosson and kalloh (groom and bride) is considered to have rebuilt one of the destroyed parts of Jerusalem.” The ultimate unity between two Jews is as bride and groom, and their connection is all the greater when it is one of joy; joy is the greatest bond. All those who contribute to their joy share in the bonding of the Jewish people; a true tikkun for the destruction which resulted from separation and discord. We heard again and again, over the week of celebration, how our Chosson and Kallah are two individuals who bring together so many, are there to help all those in need of help in very deep and meaningful ways, always offering words of strength, building up others, helping others to achieve their potential, offering a smile, pat on the back and encouragement to those who need it and then some. So many felt that way that we saw an almost unprecedented outpouring of love and joy from literally of hundreds of fellow students and friends, who couldn’t do enough to bring as must joy as they could muster from their hearts to the bride and groom. That’s nachas beyond nachas for us parents! And if that’s how they were before, as individuals, how much more so will they be now, united as a couple! May this joyous occasion be for all a source of joy and a big step in the rebuilding of Jerusalem for all Jews for all time! If the fast was indeed to cause pain and starve ourselves, I wouldn’t be very inspired to do so either. Furthermore, if the point was to feel pain, why do Jews traditionally wish others to “have an easy fast”? It should rather be “have a miserable fast”! I think we need to reframe the entire concept of the fast on Yom Kippur, which will enable us to view it in a different light. The source for fasting is in the Torah, which states “But on the tenth day of this (the seventh) month is the Day of Atonement… and you should afflict your souls…” (Vayikra/Lev. 23:27). “Afflicting” is interpreted by our sages in the Talmud to mean we should fast, hence the mitzvah to fast on Yom Kippur. This, however, needs explanation. The Torah does not say to afflict our bodies, rather our “nefashos” or souls, through the fasting. This seems strange, as a fast would seem to afflict the body, not the soul. How can we understand this? My mentor, the late Rabbi S. Wolbe ob”m, once gave us a powerful illustration by which to understand the day of Yom Kippur and its laws. Maimonides, in discussing the final world of reward, says the following: “The World to Come has no eating nor drinking, rather the righteous sitting with their crowns upon their heads, and basking in the glow of the Shechinah (Divine Presence).” This is the feeling one has on Yom Kippur. This holy day is a bit of the next world transposed to this world. On Yom Kippur, by refraining from the mundane pursuits of this world, we are transformed into an angelic state whereby we don’t need to eat, much like the angels are above eating and derive their sustenance from the glow of the Shechinah. With the closeness we enjoy, we can intensely feel any distance from the Shechinah we have caused, and fulfill the mitzvah of teshuvah, or return to God and our true selves. The Jewish world seems to be in quite a raucous state of shock over the recently released Pew Study on the state of American Jewry. The results are quite alarming, and I wonder if you have any insights to share on the matter. Many of the results of the study you mention are, indeed, very alarming and unsettling. One of the most sobering findings is that one fifth of American Jews don’t identify themselves as Jewish by religion. The trend rises to one in three among younger Jews. This has catastrophic effects on American Jewry, as these “Jews of no religion” are very unlikely to marry other Jews, raise their children as Jews, donate to Jewish causes, have any connection to Israel, or see their Jewish identity as something important in their lives. As one writer summed it up, “In short, most Jews of no religion have both feet out of the Jewish community — or at least are on their way to the exit sign.” Over 70 percent of all Jewish marriages are intermarriages (when you factor the Orthodox community out of the equation), and only 20 percent of the children of those intermarriages are being raised exclusively Jewish. And the dire statistics go on. I don’t want to oversimplify a very complicated issue or claim to have “the answer” of what to do, or that there even is an answer. If there is, it is certainly multi-faceted and with manifold, interlocking plans of action. The underlying theme, however, is clear. Education, education, education! I don’t believe most Jews who are “on their way to the exit sign” are doing so maliciously or out of a conscious desire to escape Judaism. Rather, it is out of apathy, borne of complete ignorance of the richness, depth and beauty of our belief system. A young South African Jew, known by his friends as “the skeptic” due to his rejection of anything Jewish, once attended our DATA weekend retreat after much arm-twisting by his friends. After a weekend packed with positive, engaging Jewish learning, during the time the participants shared their experiences with the group, the skeptic spoke. He said he agreed to come, certain that he would actually teach the rabbis a few things, as he already knew it all. But the opposite happened, and he found a weekend of immersion in real, authentic Jewish wisdom. For the first time, he felt proud to be part of this people and this amazing wisdom, and no longer wanted to opt out of the Jewish tradition. He ended by saying that he wasn’t yet ready to give up shrimp, but that from then on he wanted to date only Jewish girls and he believed his home should be a Jewish one. That is a success. The proof is in the pudding. If every person reading these lines takes it upon himself or herself to introduce an unaffiliated Jew to an opportunity of authentic Jewish learning, we will make a difference! A rabbi once visited pre-perestroika Soviet Russia as “a tourist.” The customs agents emptied out his suitcase at the airport, taking out numerous pairs of tefillin, tzitzit, shofars, mezuzot and books of Torah study. They looked at him and said, “Tourist, huh? !” They proceeded to return all the mitzvah artifacts to his suitcase, but left out the books. The agents said, “These you can’t have. … These are the enemies of the people!” They understood that if anything were to foster a Jewish feeling in the people the rabbi met, it would not be simply the mitzvot that he did; only Torah study could ignite the spark of their Jewish souls. Let us understand what the Bolsheviks knew. Let’s find ways to communicate pure, unadulterated Torah, to ignite as many Jewish souls as possible. The resulting fire of Sinai could transform the Jewish people again into a proud and committed nation that will keep their feet inside the door! Yom Kippur: Day of sadness or joy? I often feel depressed when we get close to Yom Kippur, just knowing I’m going to be spending such a somber, sad day. Also, I feel like a rat because I have done so many things wrong that I feel like it’s chutzpah to even ask God for forgiveness. I would appreciate it if you could provide me with some insight that would make the day a little more palatable for me. L’Shanah Tovah. Wow. If I thought Yom Kippur was a solemn, sad day that I just needed to live with for 25 hours, I would be depressed as well! It’s just that I don’t see it as a sad day at all; there’s actually a lot of room for joy on Yom Kippur, as we will see. Perhaps it is a different kind of joy than we’re accustomed to, but joy it is, nevertheless. Let us look at the laws that are unique to Yom Kippur (aside from the laws which apply to every Shabbat and to Yom Kippur as well). There are five areas we are to refrain from: eating, drinking, marital relations, wearing leather shoes and bathing or applying oils on our skin for pleasure. How are we to understand these laws? Is God out to get us or to cause us pain? The early commentaries explain that it is quite the opposite. On Yom Kippur the gates of Heaven are opened and the Al-mighty uplifts all those who are connected to Yom Kippur to their ultimate spiritual heights. Our tradition teaches that we become on that day like angels in Heaven. In the deeper sources it is said that we, for a day, actually enter a higher realm similar to that of Olam Habah, the next world. Maimonides writes, “Olam Habah has no eating or drinking; the righteous are sitting with their crowns upon their heads and basking in the bliss of the Divine Presence.” This means that in the next world the righteous will become like angels who have no need for physical food or drink. The “crowns” are their spiritual heights and connection to something higher; their sustenance to remain alive is the direct connection to the Al-mighty’s presence. My mentor, Rav Shlomo Wolbe, ob’m, often said this statement of Maimonides about the world to come is also an apt description of Yom Kippur. It is a day in which we refrain from food and drink because we, as “angels for a day,” simply have no need for physical sustenance and other mundane pleasures. We, rather, spend the day in the very deep and profound joy and bliss of basking in the presence of the Al-mighty, whose presence is very palpable on that holy day. That elevated state of consciousness and closeness to G-d is precisely what stirs us to teshuvah, the thoughts of repentance. When He brings Himself so close to us, we are ashamed of our wrongdoings and perform the confession (vidui), and resolve to improve ourselves. Rav Wolbe emphasized that the only time one should feel any sadness or remorse during Yom Kippur is when you are reciting the confession. The rest of the day is, as we said above, a time to feel deep and profound joy in the spiritual heights of this special day and in our close connection to the Al-mighty. No matter how much you may have done wrong, God doesn’t want you to live in the past but to focus on a better future. That’s why it is misplaced chutzpah to think you can’t ask for forgiveness; that’s precisely what God is waiting for! His hands are stretched out, just waiting to embrace you. All you need to do is jump into the embrace and receive the immense love that He’s waiting to bestow upon you. Just tell Him that you want that connection and that love from here on, and you have it! May you and all of us merit to connect to Yom Kippur on the deepest level — one that will grant us an eternal connection and a sweet New Year, with peace in Israel and for all of klal Yisrael throughout the world.